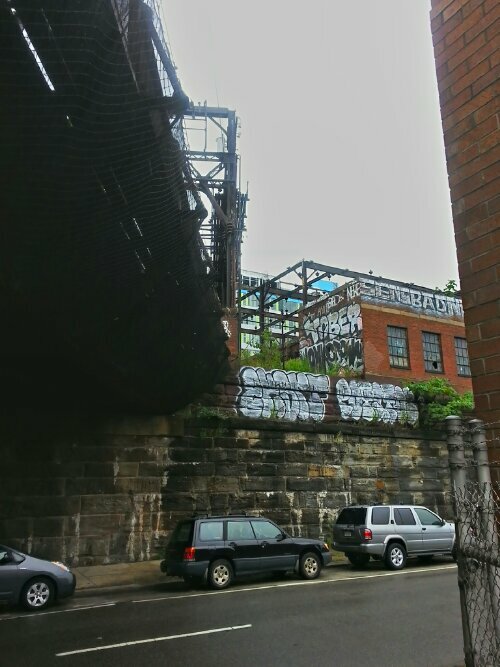 “Walking the Eraserhood” represents an ongoing street-level exploration of the Callowhill district and surrounding environs, a sort of virtual walking tour of the neighborhood. This is the first installment in the series. This is the corner colorfully referred to as “The Heart of the Eraserhood.” On the southeast corner of this intersection is the site where David Lynch first lived when he studied at Pennsylvania Academy of Fine Arts (PAFA). Lynch reports he lived, “right kitty-corner from the morgue,” which still stands on the northwest corner of the intersection, now serving an annex to the main building of Roman Catholic High School, around the block at Broad and Vine streets. On the northeast corner of this intersection stands the historic Heid building, a pivotal site in the formation of the Callowhill Industrial Historic District (CIHD). divine lorraine, a photo by rosserx on Flickr. Panorama 1747_hdr_pregamma_1_mantiuk_contrast_mapping_0.1_saturation_factor_0.8_detail_factor_1, a photo by bruhinb on Flickr. Panorama 1741_hdr_pregamma_1_mantiuk_contrast_mapping_0.1_saturation_factor_0.8_detail_factor_1, a photo by bruhinb on Flickr. Panorama 1740_hdr_pregamma_1_mantiuk_contrast_mapping_0.1_saturation_factor_0.8_detail_factor_1, a photo by bruhinb on Flickr.